Engrossing characters and mystery. MISSILE! Our expectations were immediately set sky high the minute we heard that the lead designer of Ghost Trick was none other than the creator of the Ace Attorney series, Shu Takumi. 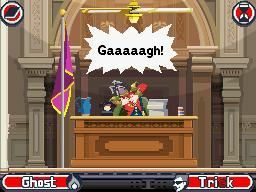 While it bears little resemblance gameplay-wise to the courtroom drama, Ghost Trick most definitely lives up to the standard set by Phoenix Wright's adventures. It's hard to talk about what makes the story and characters so great without getting into spoiler territory, but here's the basic set up of the story and gameplay (or you could just play the flash demo if you're so inclined). Main character Sissel wakes up after being shot and finds himself dead but somehow conscious. A mysterious talking lamp tells him that although he's dead, he possesses a "ghost trick" power that allows him to manipulate inanimate objects. His new powers have limits though – he can only jump between objects that are close together, and he can only manipulate them in small ways, like turning on and off electrical appliances and giving light objects a small nudge. To get around, he can travel though phone lines, but only after he's possessed a phone while it's in-use to trace the location on the other end (although once you've traced the number you can travel to that location any time thereafter). Finally, he only has one night to discover the truth surrounding his murder – once the sun rises he will cease to exist completely. Sissel has complete amnesia – no memory of who he is whatsoever, and no idea who killed him or why. So naturally, his quest is to find answers to these questions. Although it's his own life he's primarily interested in, he soon discovers that he also has the power to save the lives of others. When he comes across any recently dead body, he can rewind time to four minutes before the person died, to see how the victim met his or her fate and then try to avert it using his ghost tricks. There's a part near the beginning (this is a minor spoiler, so if you're particularly sensitive, scroll down to the next paragraph) when Sissel saves a young detective named Lynne from death for the first time, and he beseeches her to help him solve the mystery of his murder. She refuses, saying that she's working on an important case tonight and doesn't have time to help him – despite this being his last night on earth – and won't even give him the details of her case. Instead of cursing her for what would seem like an ungrateful act, Sissel vows that he will do whatever he can to protect her for the rest of the night (a group of assassins wants her dead). Why? Because by being brutally honest to him, instead of making a false promise to help him, Lynne proved herself to be trustworthy in Sissel's eyes. Lucky for him, it slowly becomes clear over the course of the night that Lynne's investigation and his own mystery are crucially intertwined in a larger, mind-boggling conspiracy. The point is, Ghost Trick's characters, like its plot, are many-layered – and one character's initial callousness may belie a deeply noble secret motive. In a single game, Ghost Trick establishes characters as endearing as any in the Phoenix Wright series – easily some of Shu Takumi's best work to date. In particular, Missile the dog will make your heart hurt with his selfless love and devotion to his mistress Kamila. No spoilers – just trust us. From a purely gameplay perspective however, like the Ace Attorney series, Ghost Trick isn't anything special – its story and characters still steal the show. It's definitely a more active experience compared to Phoenix Wright though, and some of the puzzles, especially near the end of the game, are quite challenging. Most of Ghost Trick's puzzles work in a way that's reminiscent of a Rube Goldberg machine. Since Sissel can only manipulate objects in little ways, in order for him to affect any kind of major change he has to create a domino effect where several small acts – a nudge here, a roll there – end up sparking a chain reaction that disrupts an event just enough to tip fate in his favor. It's a totally novel mechanic, and one that often involves not only careful timing but also planning, because the order in which you perform your tricks on objects can make or break your chances of success. It's also a mechanic that often requires a lot of trial and error to discover how each object reacts when you manipulate it. The top screen gives a general indication of how the object will react to your trick with words like "turn on/off," "spin," and so forth, but you need to know exactly what the object does before you can factor it into your plans, because precision is always key when setting up your dominos. This experimentation is often part of the fun of solving each puzzle, but it also leads to frustration because some actions can't be undone without resetting time back to the beginning. If you push a vase off a ledge, there's no way to put it back – especially if it breaks. Ghost Trick is fairly good about breaking up each puzzle into sections so that you never have to rewind too far, but it would have been nice if there was an "undo" button to make experimentation easier, since it's such an integral part of forming your solution. Despite occasional frustration though, the more active gameplay of Ghost Trick is a welcome change from the mostly passive adventures of Ace Attorney (a series we also love!). To be clear, the two series are totally different – the only thing that gives Ghost Trick away as being from the same creator as the Ace Attorney series is how much heart the characters have. Because of that, we're hoping this isn't the last we see of them.